Should You Let Your Flapjack Plants Bloom? Should you let your flapjack plants (Kalanchoe luciae) bloom? I’m recommending no…but it’s not that cut-and-dried (no pun intended). Like other succulents with overlapping leaves along a single stem, when Kalanchoe luciae blooms, the entire plant elongates. This is how those in my window box looked in March of last year. If your goal is to have a lot of new little plants, one option is to let the mother plant bloom. Providing it survives the effort (they usually do, but not always), you’ve hit the jackpot. Harvest each cluster with several inches of stem attached to anchor it, and start it as a cutting. Roots will grow from leaf axils (where leaves are attached to the stem). I didn’t want awkwardly tall plants in my window box, so when the flapjacks started to elongate in March, I snipped off the bloom spikes. The mother plants seemed determined to flower regardless, and buds grew from leaf axils beneath the cut. I was just as determined they weren’t going to flower, so I pinched out the buds. Within a month, the plants’ topmost leaves turned beige and crisp along the edges. I’m not sure why this happened, but I trimmed them to keep the plants tidy. By June, new little leaves concealed the truncated stems, indicating that the plants had been gearing up to produce offsets. When they couldn’t do it along a bloom spike, they did so closer to the core. Here’s how one of the plants looked in August. And again in October. Other plants in the window box are blue echeverias and Euphorbia tirucalli ‘Sticks on Fire’. Update: I wrote the above post two years ago. This is how the same windowbox looks now. It has been wonderfully low-maintenance. The aeoniums have grown more, I’ve pruned the ‘Sticks on Fire’, and I switched out the echeverias. But all I’ve done with the Kalanchoe luciae is to remove dry leaves and any new flower stalks…which I’m about to do right now. https://debraleebaldwin.com/wp-content/uploads/2016/02/IMG_4801_640x406_annotated.jpg 406 640 Debra http://debraleebaldwin.com/wp-content/uploads/2015/04/Logo-White-H200px.png Debra2016-02-05 21:37:182018-10-18 10:03:01Should You Let Your Flapjack Plants Bloom? I find that the flapjacks stay red when they have generous amounts of light but very little watering. I have dozens across multiple areas at a job site anf those that are in the shade more than half the day and/or get too much water turn green and produce A LOT MORE of the powdery white stem cover. Thanks, Emily, good to know! I purchased a flapjack plant two weeks ago, it’ very healthy and green. I placed it on my porch where it gets plenty of sun. It will likely turn red gradually. If you don’t notice that the edges are reddening, it may be a variety that doesn’t. I have a number of young fapjack plants and I think the secret to them turning very red is to starve them for water, and let them be in a sunny but cold position. Good luck ! 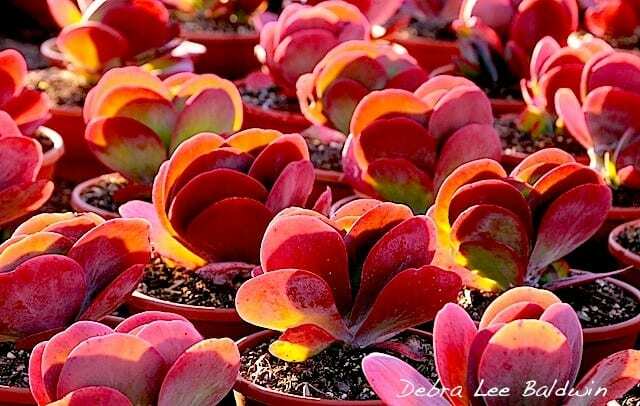 Hi Debra, Just read your post on Kalanchoe ‘Flapjack’ — I live in SoCal (plenty of sun and dry air). When our Flapjacks started to bloom, I cut the stem off, and now the baby plants are forming in clusters around the outer base. Just out of curiosity, if you leave the Mother plant intact at flowering & let the ‘babies’ remain in place….what happens? Do they fall off and start growing? Just wondering….thanks for the info about how to remove the main stem with plantlets and root them. Great website, thank you! Hi Cynthia — The plantlets will continue to drain the main plant which may keel over, thereby putting its offspring on the ground, where they can root. I have a Flap Jack that has sent out a large chute. It has a flower stem. What should I do with this? I live in Florida and it has been very dry. Thank you. Hi Ina, You can enjoy the bloom but risk losing the plant, or sever the spike close to the plant and hope it recovers. Up to you. How do we get the Flapjack leaves red as shown in the first picture? I read somewhere that the paddle plant is monocarpic like agaves and dies after flowering. Not a problem as they produce plenty of offsets to take the place of the old stalk. I have one flowering qt the moment. Not very exciting but my husband walked by the other day and said ‘You do grow some amazing plants” I like that. Hi Jenny — They’re not monocarpic in the strict sense of the word, which is to say they don’t die after flowering. What happens, though, if you don’t cut them back, is that so much energy goes into the bloom stalk that the plant exhausts itself. I wish I would have known this information awhile ago, but am glad to know it now! I’ve misinformed a couple of people on their Kalanchoe Lucias, but will never do it again! Thank you for sharing. Glad I could help! Thanks, Mary. I have a very large flap jack, paddle plant, that i bought when it was tiny. It now has a stem coming out of it that is about 6 ft tall. Its in a pot on my front porch, when its too cold, i move it indoors. If i had known it was going to die after blooming, i would have cut this off right away but i do not like altering the “natural” cycle of my plants. Thank you so much for your informative site as i had no idea what this plant was, much less what it was doing! She is beautiful, and feels pleasant to the touch which is why i chose her.